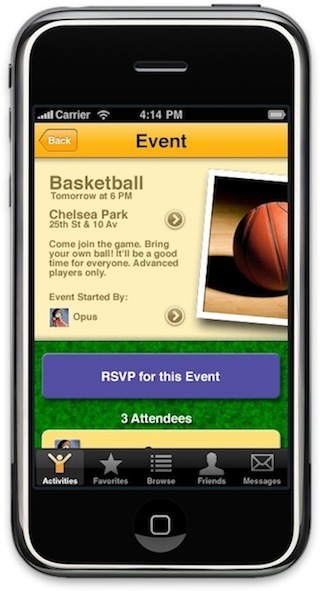 An iPhone app designed to help people discover athletic facilities in their neighborhoods. 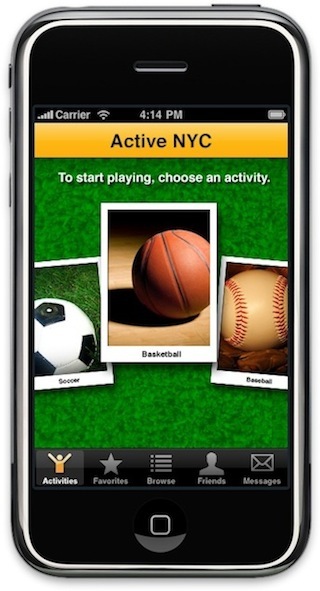 Active NYC is an iPhone application that helps people discover athletic facilities in their neighborhoods, and allows for simple scheduling and notification of events that take place at those facilities with their neighbors. Jim is a 31 year old man who lives in New York City and enjoys playing basketball. Though he's not part of a team or league, he plays for fun, and he likes to join an informal game when he gets the chance. He recently downloaded Active NYC on his iPhone to get in on those games more often. There's a basketball court near Jim's apartment, but after looking it up on Active NYC, he saw a review that said the hoop was damaged and the basketball court was not usable. 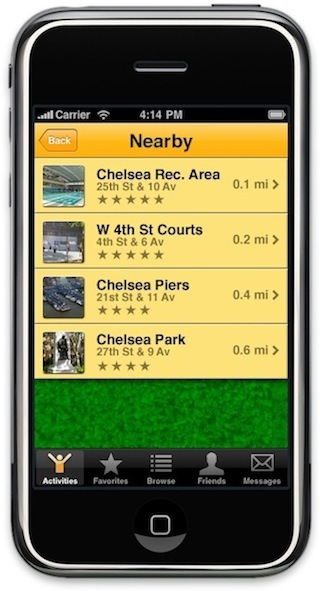 Instead, Jim used Active NYC to find other nearby courts, and Chelsea Park turned up in the search results. Jim hadn't know about Chelsea Park, but it's near Jim's apartment and it would be convenient for him to play. Since he gets home from work around 5pm most weekdays, he used Active NYC to register for any basketball activities that happen between 5pm and 9pm. Now, Jim will automatically get a message when a new game is announced. A few days after Jim registers for notifications, a man named Bob heads to Chelsea Park to look for a game to join in on. Bob is Jim's neighbor, but they don't know each other. There are no games going on when Bob arrives, but he uses Active NYC on his iPhone to find Chelsea Park and sends an announcement to everyone who's registered and available that might want to play. Jim is at home and receives the message. He decides to head over to the park and join the game. He and Bob and a few other neighbors have a great time playing the game, and head home. The next week, a similar situation occurs. Bob sends out another message for a new game. 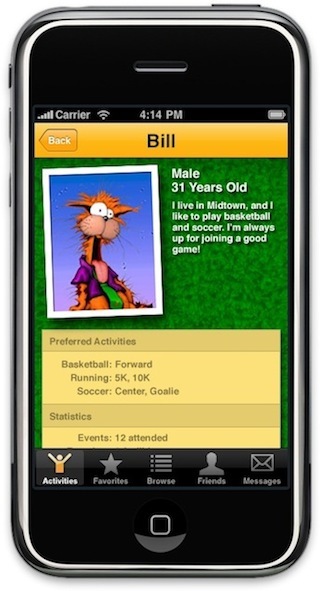 This time, Jim remembers Bob, so he adds him as a friend on Active NYC and heads over to the park to play. Bob remembers Jim, too, so Bob also adds Jim as a friend. The two become good friends who occasionally exchange messages through Active NYC for basketball games. The app would also include the same kinds of facilities that are privately owned. One of the core goals of this application is to connect neighbors through sports and activities. It uses parks facilities near users' homes as a common ground on which to build social relationships. Those relationships may only last for a game, but the app encourages longer term relationships by allowing users to add each other as friends so they can find each other again later. It also lets users post reviews of particular facilities they enjoy, adding an additional layer of involvement and social engagement. While trying to encourage new social relationships, the app is also designed to protect users' privacy. Users can choose to post whatever information they like on their own profiles on the site, but the information does not need to be true, and it would not be censored. Ultimately, if people are going to meet together to play games, they will have to show their faces in the real world, so online anonymity should not be a major issue. Active NYC also offers a form of presence. Users can preselect times when they would be available to participate in sports. They will receive announcement messages of games during those times. To protect users' privacy, the registration and notifications are completely opt-in. The review system of the application includes two tangible component to its design. Users are encouraged to take photos using their device's cameras and to submit those photos to the system so that other users a perspective of the facility, or can get a visible indication of the condition of the facility. A goal of the application is to encourage usage of parks facilities, and a good way to do that is by visually seeing something that might interest them. The app also makes use of the swipe gesture. On several screens of the application, stacks of photos are visible that the user can swipe through to show photos at larger sizes or to scroll through menus. 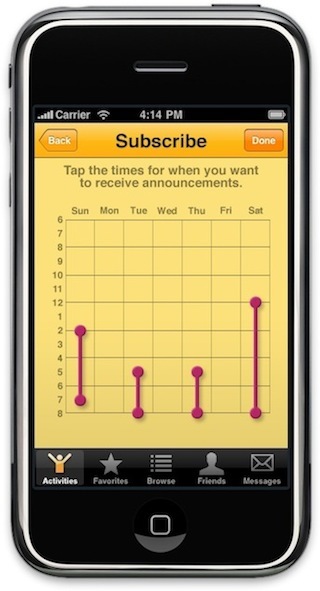 To set times for availability, the user can touch and drag on the time. 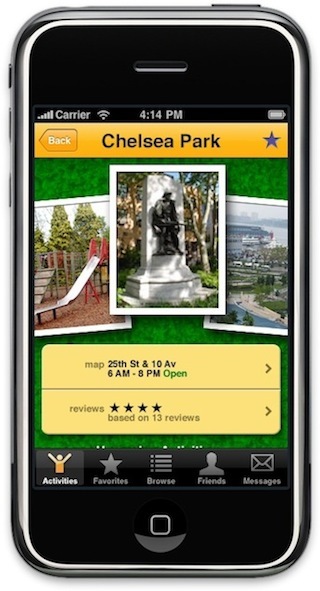 The app uses the user's location to determine what parks facilities are near them. I think an ideal situation would be if a user were to discover that a park just around the corner has a handball court or soccer field that they didn't know about. The app is designed to encourage both discovery of new facilities and usage of older facilities that the user may have forgotten about. The notification system provides an additional means of ubiquity. The user can sign up ahead of time to receive notifications about activities that are about to start at the facility. The user would receive those messages no matter where they are, and the user could choose to act on them or ignore them depending on their circumstances. The notifications would be stored in the user's inbox on the site for later reference and organization.